Summary: With her thirtieth birthday looming, Liz Kroft is heading for the hills—literally. Her emotional baggage weighs her down more than her backpack, but a three-week trek promises the solitude she craves—at least until her boyfriend, Dante, decides to tag along. His broad moral streak makes the prospect of confessing her sins more difficult, but as much as she fears his judgment, she fears losing him more. Maybe. When I received a copy of THE MIDDLE OF SOMEWHERE by Sonja Yoerg, I was extremely excited. This novel was one that I heard about at the BEA Book Group Speed Dating Session and wrote down as must-read for this fall. In addition, I enjoyed the author's previous novel HOUSE BROKEN -- you can read my review here. THE MIDDLE OF SOMEWHERE tells the story of Liz Kroft, an almost 30 year old who decides to take a three week hike along the John Muir Trail. Liz is definitely dealing with some pretty heavy issues from her past, and she is looking forward to having some time to herself to work through her pain. However, her boyfriend Dante decides to come with her... even though he's not exactly the hiking type! On one hand, Liz knows that she should tell her secrets to Dante, but Dante has strong feelings about what's right and wrong and she's afraid she might lose him. On the other, she's not sure she even wants to continue her relationship with him. Wracked with guilt, Liz and Dante begin their journey. There experience many ups and downs (both literally and figuratively) as they travel the trail. However, when serious storms and two very odd brothers appear, Liz realizes that this adventure has turned very dangerous. Liz is forced to decide if she wants to continue with Dante and if she can face admitting the regrets from her past. I enjoyed THE MIDDLE OF SOMEWHERE but I didn't like it quite as much as HOUSE UNBROKEN. I think I'm probably alone with these feelings based on other reviews out there. It's not that I don't think this book is very well written. Rather I just couldn't relate to Liz; and for much of the novel, I didn't really care for her. I admit that I had a few issues with her past decisions, and I had a hard time feeling an affinity with her. It probably didn't help that I'm just not the outdoorsy type and didn't fully appreciate the descriptions of hiking and the trail. One thing I can definitely say about THE MIDDLE OF SOMEWHERE is that Liz was a well-developed character. Even though I had some issues with her, I appreciated how complex she was. The guilt she had been carrying for years was weighing her down so much that she couldn't fully engage in a relationship with Dante. Her inability to share her innermost thoughts with him didn't help matters either. As the story progressed, more information became available about Liz's past; and I'll admit that I did begin to like her a bit more. Once I realized the extent of her pain, I felt bad for her and I definitely was rooting for her to come to terms with her past and forgive herself. Even though Liz did bring some of her pain onto herself, she blamed herself for everything... even those things which were out of her control. I can't imagine how miserable she was and how much she needed to work through things while challenging herself to such a rigorous hike. Another thing that I appreciated about THE MIDDLE OF SOMEWHERE were the author's descriptions of the trail. It's apparent that she traveled these paths quite a bit and she definitely brought them to life with her prose. As I mentioned before, I'm not one who enjoys hiking so this trip sounded like hell to me, but I did like that I got an idea of what a three week trip on the John Muir Trail would entail. In addition, I thought Ms. Yoerg's descriptions of the setting were outstanding. I could almost picture the beauty of the trail with her vivid details about the majestic mountains. And finally, I really enjoyed how Ms. Yoerg used Liz's journey on the trail as an allegory to her journey in life. As Liz was trying to deal with a huge amount of guilt and grief, she was also taking on a mammoth effort to hike for three weeks in a variety of elements. The ups and downs of her path to self-discovery were linked closed to what she experienced on the trail. Her decisions to tackle things alone or with Dante mirrored some of the decisions she was trying to work through in her personal life. I don't want to give too much more away about how these things were so closely related, but suffice it to say that I liked how well the author linked the two journeys. THE MIDDLE OF SOMEWHERE would make an outstanding book club selection and there's even a discussion guide in the back of the book. Unfortunately, I wasn't able to find a copy of it on-line. Some of the themes you might want to explore include secrets, guilt, grief, religion, hope, lies, perseverance, courage, and forgiveness. In addition, you might want to discuss some of the allegories in the story including the actual journey itself and how evil and good was represented. THE MIDDLE OF SOMEWHERE has a little bit of something for everyone. It's a beautifully written story that also tackles some serious issues. Recommended to fans of women's fiction and book clubs. 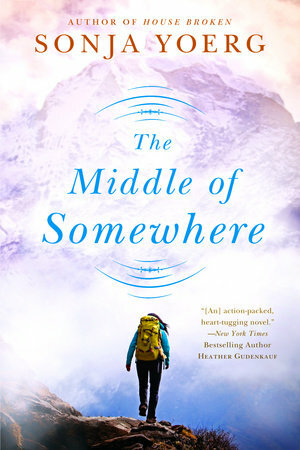 Giveaway alert: I have a copy of THE MIDDLE OF SOMEWHERE to share with one lucky reader courtesy of the publisher. To enter, just fill out the form below before September 14th at 11:59 p.m. EST. I will randomly select and notify the winner the following day. This contest is open to those of you with U.S. addresses only. Good luck! I've wanted to read this ever since Speed Dating! I'm very curious about Liz and her behavior after reading your review.